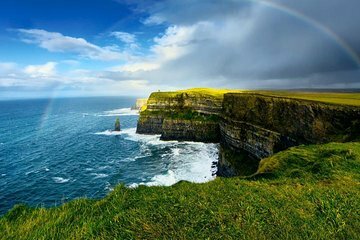 Stand in awe atop the mighty Cliffs of Moher, one of Ireland’s most famous natural wonders, on this private full-day tour from Limerick. Hike along the 700-foot (213 meter) high cliffs; take a cruise beneath the cliffs (optional) and admire spectacular views over the Atlantic Coast, Galway Bay and the Aran Islands. Your private tour can be customised to your preferences so you could also visit the Irish folk music capital of Doolin, explore the otherworldly landscapes of The Burren or visit Bunratty Castle. Unlike on group tours, this private option lets you tailor your itinerary and make unscheduled stops. Tony Murphy spent a second day with us at the Cliffs of Moher. Excellent tour guide with lots of historical information. The weather was perfect and we enjoyed seeing the countryside and coast. Long day but well worth it. Munsterbus, Tony Murphy was a perfect choice as a guide for a tour of the Cliffs! He provided us with outstanding service and was well prepared with local information and entertaining highlights. We appreciated his ability to avoid the 'bus' crowds which enabled us to get some great photographs. Booking a private tour was the right choice for our group of four. Viator's booking service was convenient to use. The requirement to phone the tour operator was a bit difficult since we were not traveling with international phone...perhaps giving us the tour operator's email would have been a better choice. It was a wonderful tour. Very informative, funny and showed us some places we would not have gone to otherwise. We will definitely use Viator again for tours.